Is my dog a Carnivore? Is my dog a Carnivore? Why are some questioning this? Shouldn’t it be pretty straight forward? I’m not sure about you but when I look at my dogs teeth and jaw set I see a Carnivore. When I watch my dog hunt and chase down a small prey, shake it and then crunch it up and eat it, I see a Carnivore (sorry bunny lovers). Perhaps your dog has never had the opportunity to hunt and kill prey, but it does not mean he does not have the inherent ability to do so. 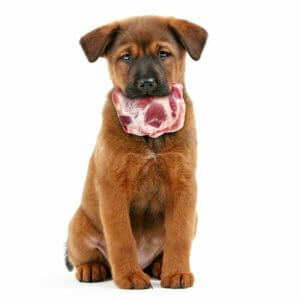 There are certainly other things that point to a dog being a Carnivore that we can’t see with the naked eye. Their digestive system for example, A Carnivore has a short digestive system with little ability to break down vegetative matter unless partially broken down by the prey animal’s digestive juices (or broken down by us through grinding, dehydrating or steaming). If you really want the scientific facts on this subject we found an amazing 4 part video series done by Dr. Conor Brady in Australia. We think after you watch the 4 videos you will know why there is no confusing the matter- dogs are Carnivores. And further more, since they are Carnivores, what are we doing to them when we feed them like Omnivores or Herbivores? And who is creating the confusing message that dogs are not Carnivores and why? That might be a topic for another blog. Happy Raw Feeding, Friends. This entry was posted in Raw Pet Food. Bookmark the permalink.